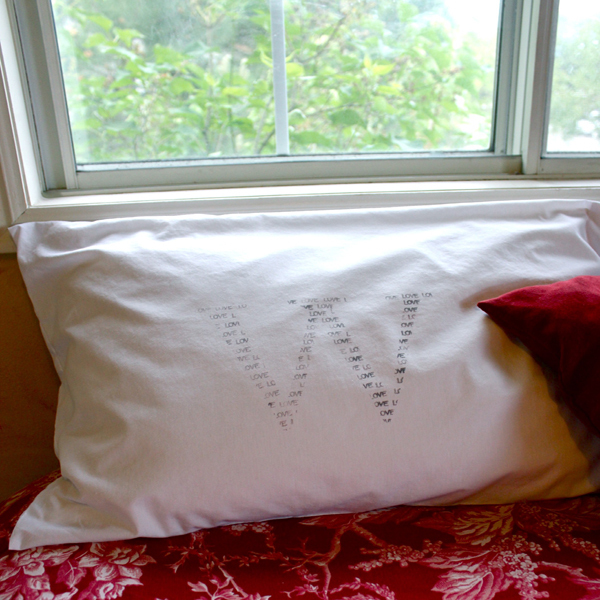 Project Description: Stamped Monogram Pillowcases are a unique way to update a bedroom. They also make a special, personalized wedding gift that’s very affordable. You’ll first want to wash, dry, and iron the pillowcases you’ll be using. Choose pillowcases that are 100% cotton, as the ink won’t set as well on man-made fabrics. Print out a large letter to serve as your template. Depending on the letter, you may want to change the orientation of your page to landscape. Increase the font size and print. Use an X-Acto knife or razor to cut along the outside edge of your letter. If your razor is very sharp, it will cut through both the film and the printed paper easily, but you really only need to be certain that the film layer is cut. Turn the mat as needed to achieve the best angle for cutting. Remove the tape and film. Discard the printed letter. 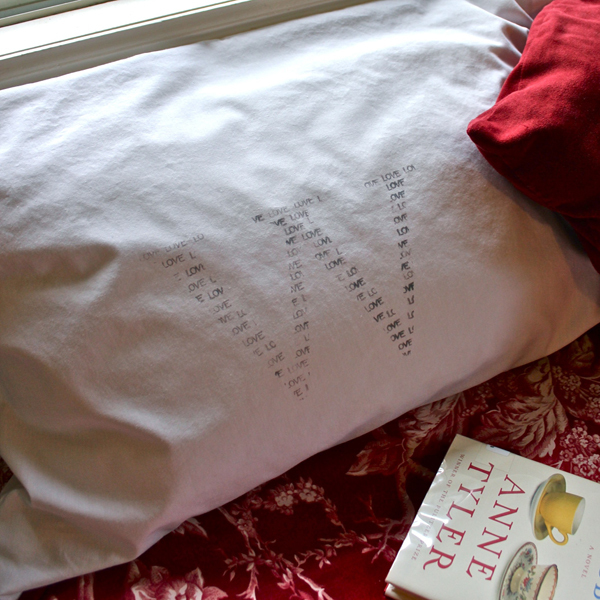 Insert a piece of paper or cardboard into your pillowcase, to prevent the ink from bleeding through to the backside. Carefully peel the paper backing off of the film. If the film accidentally adheres to itself while you’re removing the backing, you can peel it apart again, but try to avoid it in the first place. Smooth the film sheet onto the center of the pillowcase, making sure there aren’t any wrinkles. The great thing about Frisket film is that it’s repositionable, so if you don’t get it quite right the first time, just lift it and try again. Press down along the edges to make sure you have a good seal. Now we can stamp. I’ve chosen a stamp that says “love.” You could also stamp a background pattern, or a graphic like butterflies. It’s important that you choose an appropriate permanent ink. The inkpad I would recommend most is VersaColor, which is a pigment based ink that does beautifully on fabrics. My second choice would be StazOn, which is a solvent ink pad. (The manufacturer doesn’t recommend StazOn for fabric, and it will fade slightly in the wash, but I’ve used it on multiple projects and have been happy with the results. Stamp the image repeatedly over the cut-out of your letter. Stagger the placement of the stamp for interest. Once you’re finished, peel off the film. It comes off cleanly, leaving a crisp outline. If you plan on making more than one pillowcase, you can re-use the film on the next one. This is definitely a big advantage that Frisket Film has over other stenciling techniques, like freezer paper. Just place it on a piece of wax paper until you’re ready to use it. 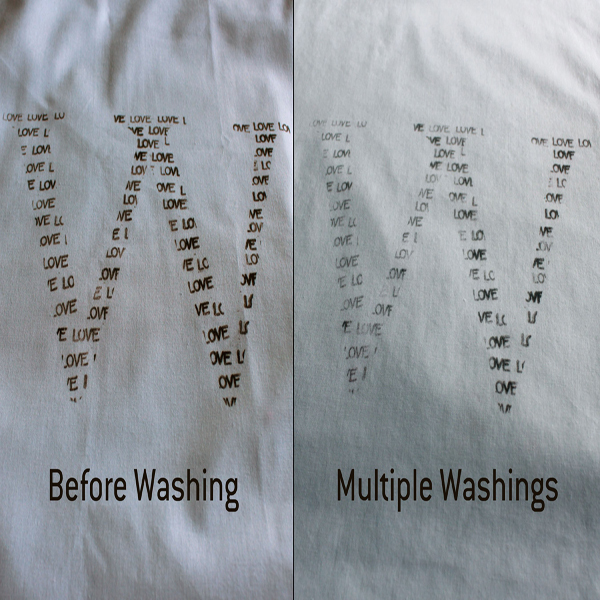 Heat-setting the ink with an iron will make the image fade less in the wash. It’s a good idea to cover your image with a piece of scrap fabric, then iron over it without steam. Place in the wash before using.